DrumHeads everywhere, as far as the eye can see, waiting outside the doors to open. The Modern Drummer Festival Weekend, held at Montclair State University in New Jersey, is an event I look forward to all year long. (Me and more than a thousand other DrumHeads!) Those of you who have been to one, know what I mean. Those who haven't, should try to get there  at least once. This year's MD Fest was a total sellout, as it has been from the very first one - 15 years ago. After all, an entire weekend of drum clinics and performances by the world's greatest drummers (not to mention cool prizes) is pure heaven for any DrumHead! Richie (Flores), Robby (Ameen), and Robert (Vilera) opened up this year's event and what a powerful opening it was. They each played solo and then all together, bringing the crowd of over a thousand drummers to their feet in appreciation. 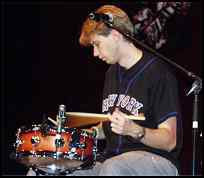 A virtual unknown just a few years ago, every one knows John now supplies the drum power behind Prince. 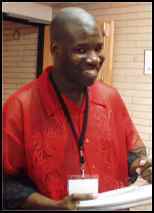 For the MD Fest, he appeared with his group The John Blackwell Matrix, which featured Bruce Bartlett on guitar, Baron Brown on bass, Tom Coster on keyboards, and his dad, John Blackwell Sr., on drums. I caught John signing a Drumhead's drumhead! As important as the Modern Drummer Festival is to the average DrumHead, it's even more important to those with backstage access. I'm talking about networking (not the computer kind), and it all takes place backstage from the initial sound check on Saturday morning before the doors officially open, until the final cymbal crash on Sunday night. Here's where gear manufacturers and pro-drummers all get the chance to say hey, make deals, trade business cards and network. 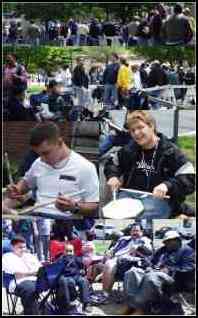 That's part of why the Modern Drummer Fest is so important. It's not only a source of entertainment and education for the DrumHeads in the audience, but it is also an important networking connection for the entire drum industry. And it all started one day when a DrumHead had an idea that drummers should have a magazine of their own. That DrumHead was Ron Spagnardi, Publisher of Modern Drummer Magazine and Festival Producer (see the sidebar for my interview with Ron). And although, by Ron's own admission, the idea for the Festival Weekend was the brainchild of Production coordinator Rick Van Horn, without Modern Drummer Magazine there would be no MD Fest. 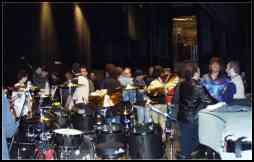 Behind the scenes: DrumPros "network" backstage. Here's the rest of Saturday night's Super-Drummer lineup. If any DrumHeads in the audience thought Billy was just another pop drummer before his segment, I'm sure they changed their minds after his performance. He demonstrated some techniques as he played along with some canned tracks from *NSYNCH and his video, Takin' Care of Business. Billy doing his soundcheck backstage. Billy doing his thing front stage. 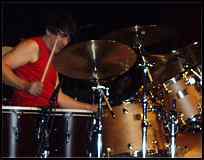 I'm sure most of you older DrumHeads remember the great big band drummer Sonny Igoe, well his son Tommy can play too! His impressive performance consisted of playing along with prerecorded tracks from his solo album, New Ground, and he also treated the audience to a demonstration of his favorite practice techniques. A performance to make his dad proud who, by the way, was also in the audience. Tommy in the clinic segment of his performance. Phillips began his career with his father's band and recorded while still in his teens. He has since worked with some of the greatest names in the US and England, including Jeff Beck, Stanley Clarke, Al DiMeola, Jack Bruce, Pete Townsend, The Who, and Toto. Simon, who is also a composer, released his first solo album Protocol, in 1989. Although Simon is better known for his rock, pop, and metal drumming style, he treated the audience to a spirited performance with Vantage Point, an instrumental jazz group consisting of Jeff Babko on keyboards, Dave Carpenter on bass, Brandon Fields on sax, and Walt Fowler on trumpet. Simon closes the Saturday Fest. Click the following link for MD Festival 2002: Sunday Performances!